Copper is the horse that I wanted Lil Man to be. A partner for a variety of disciplines. So far we’ve worked towards western pleasure and hunter under saddle successfully at the local level. But we’ve been working at this for a while now. My cute fluffem when he was 11 months old. Copper has been with me since he was 11 months old, and he is currently a month shy of being 8. Unlike Lil Man, Copper’s issues were born of youth and lack of training, not from being allowed to push people around and get away with it for extended periods of time. 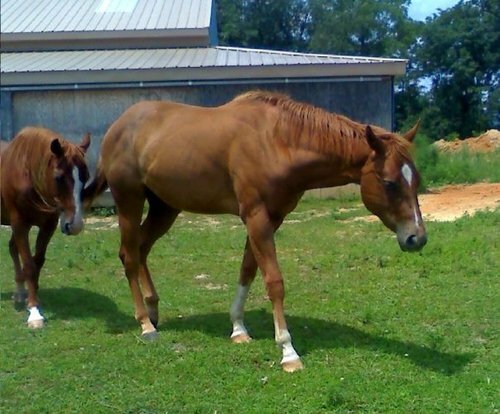 Copper was born to halter horse parents. At that point, I wanted a halter baby, so he seemed like a good fit. Both of his parents had National titles and his grand sire had multiple World and National riding titles, so there was the potential that he could be a riding horse. 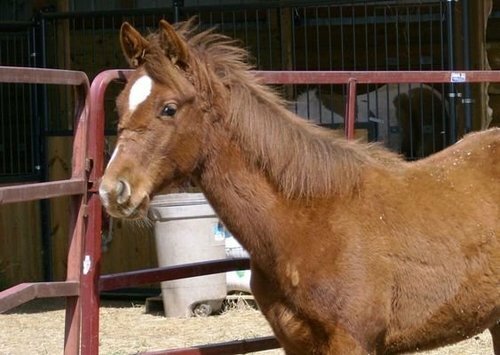 Copper in April of 2009, looking like a baby at the boarding barn where he wasn’t getting enough turnout. 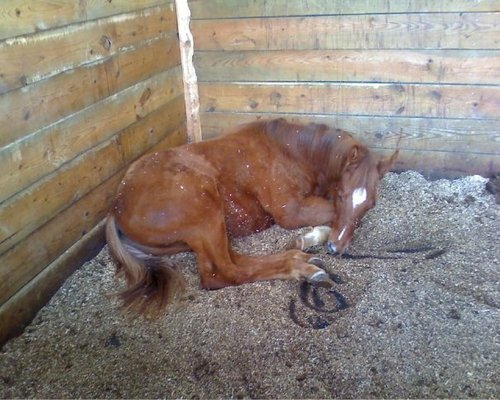 When Copper was delivered, he was a shy baby who slept all day long and jumped if you raised your voice at him. He’s much more confident now, and the reason for the massive amounts of sleeping was that he was growing to become much larger than people thought he would get. 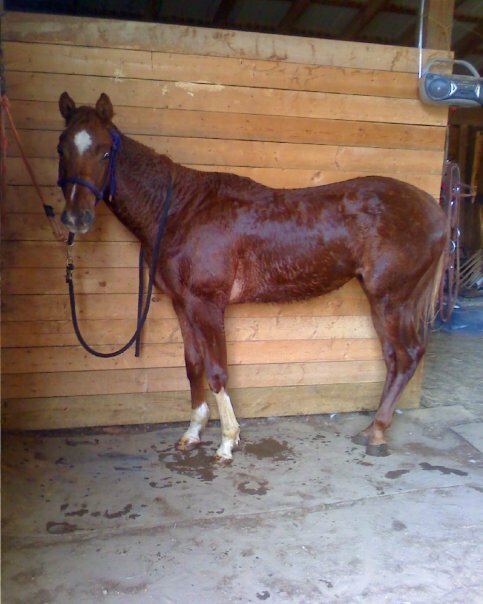 He was a small yearling, so everyone just assumed that he would be 14.2 forever. Now, he’s over 16hh and I generally use a mounting block for convenience. I rode him myself a couple of times as a two year old, but he wasn’t strong enough to really go into work at that point. 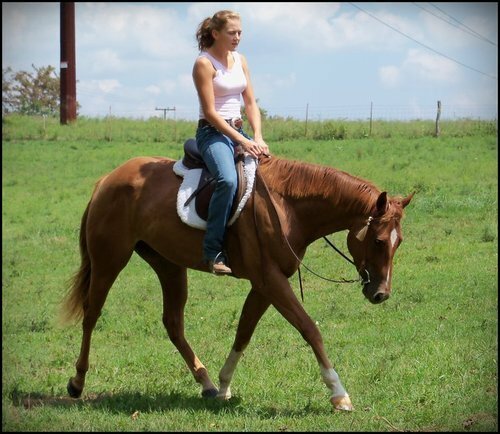 A friend of mine, A, started him under saddle for me when he turned three. At three, he was certainly strong. The first time she rode him outside of the barn he bucked more impressively than any horse we’d ever witnessed. I still wish I had video of the moves he’s capable of. My confidence was still pretty shaken from being Lil Man’s crash test dummy, so crawling on my very green three year old was more than a little scary, and it didn’t help that he was obviously skilled at bucking. So I let A ride and show him for a while, riding him occasionally myself to prove that he wasn’t scary. A riding Copper as a three year old. Once I started to get over my fears, life got in the way and I started to plan my wedding, remodel my house, etc. so I continued to let A ride and show him. 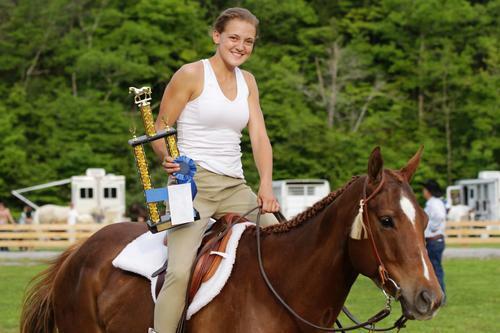 They were successful in hunter under saddle and trail at local shows. Winning trail at an open show as a five year old despite having only seen one of the obstacles in his life. In the Fall of 2012, he moved back home with me for me to start working with him and work towards something together. Then my father was diagnosed with ALS and everything took a nosedive. I continued to work on my house, but didn’t put any effort into moving forward with my horses really. I fed them and kept them up to date on vet work, but no training occurred. In May of 2014, my father passed away because of his illness and it was like resurfacing from being underwater. My father and I were very close throughout my entire adult life, and from January-May, I was living with him half of the time to help him with his medications, his finances, and normal day to day things. I had a great support system of family members and healthcare professionals, but I didn’t have the time to do anything other than feed and water my horses. Back in 2013, I decided to sell Copper. I posted him on various websites and received more hits on him in a month than I did on Lil Man in two years. Despite having a lot of interested buyers, I didn’t let anyone come look at him. He wasn’t being worked, so I didn’t know what shenanigans he’d perform, and I hated to have people drive a distance with that as a possibility. So in the summer of 2014, I put him in training with G to prepare him to sell. He didn’t look like much when I pulled him off of the trailer at G’s. He was underweight and despite having been hauled several times in his life, was snorty and jumpy. I’d told G to be prepared for some pretty impressive bucking, but he never bucked once at G’s. G had a college interested in Copper as a mount for their Western Riding team, but they were waiting to see how his lope developed in training. I was taking lessons on one of G’s reining horses at the time, so I decided to take a lesson on Copper since he seemed to be doing so well. Poor quality screen shot from a lesson video. After the first lesson, he was no longer for sale. G agreed that it would be smart to keep him. I left Copper in training with G for 90 days, and we had our first unassisted show. I’d shown Copper a handful of times, but only after A had ridden him down for me. G pushed me to be independent and to push past my distrust of my horse, and the results have been great. Copper is such a cutie! He really is. 🙂 Thanks! What a lovely horse he is. I’m glad that you kept him.